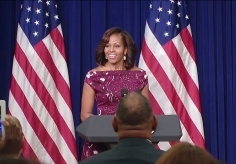 Click here to access a transcribed copy of the First Lady's remarks. July 10, 2013 — More people are running, biking, and exercising in other ways in hundreds of US counties, according to new research from the Institute for Health Metrics and Evaluation (IHME) at the University of Washington. The rise in physical activity levels will have a positive health impact on Americans by reducing death and chronic disability from cardiovascular diseases and diabetes. But the trend has had little impact so far on stopping the rising tide of obesity. As physical activity increased between 2001 and 2009, so did the percentage of the population considered obese. Obesity and risk factors from poor diets, smoking, and high blood pressure all are causing a drag on US life expectancies, which increased slowly compared to the country’s economic peers between 1985 and 2010. These results were published July 10 in the open-access, peer-reviewed journal Population Health Metrics in two studies—“Left Behind: Widening Disparities for Males and Females in US County Life Expectancy, 1985-2010” and “Prevalence of Physical Activity and Obesity in US Counties 2001-2011: A Road Map for Action.” The findings will be presented today by Dr. Christopher Murray, IHME Director and one of the lead authors on the study at an event for mayors and other local officials hosted by First Lady Michelle Obama as part of the Let’s Move! Cities, Towns, and Counties anniversary convening. Counties in Kentucky, Georgia, and Florida all reported big gains in physical activity. The highest increase for men was in Concho County, Texas, up from 41.4% in 2001 to 58.2% in 2009, and women in Morgan County, Kentucky, increased from 25.7% to 44%. For the study, sufficient physical activity was defined as 150 total minutes of moderate activity per week or 75 minutes of vigorous activity. By this definition, which counties were the most and least active for men in 2011? Which counties were the most active and least active for women in 2011? The highest increase in obesity for men was in Lewis County, Kentucky, which jumped from 28.9% in 2001 to 44.7% in 2009. For women in Berkeley County, South Carolina, obesity rates increased from 31.6% in 2001 to 47.9% in 2009. Which counties had the lowest and highest percentages of obesity in men in 2011? 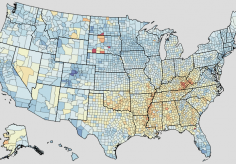 Which counties had the lowest and highest percentages of obesity in women in 2011? Because of the increase in obesity over the last two decades, high body mass index (BMI) is now the third-leading risk factor to health, according to “The State of US Health, 1990-2010: Burden of Diseases, Injuries, and Risk Factors”—another IHME study published today, in the Journal of the American Medical Association. The toll posed by obesity was also cited in another new IHME study, on life expectancy. The highest life expectancy for men increased from 75.5 years in 1985 to 81.7 years in 2010, and the lowest life expectancy remained under 65, which ranks below Indonesia. For women at the county level, the highest life expectancy increased from 81.1 years in 1985 to 85 years in 2010, and lowest life expectancy remained at about 73 years, lower than Botswana. “That’s slow progress in life expectancy compared to other countries around the world, and it’s especially slow for women,” said Dr. Haidong Wang, Assistant Professor of Global Health at IHME and lead author on the life expectancy study. In 1,405 counties in the US, there was no significant change in life expectancy for women in a quarter century. The same was true in 154 counties for men. Women in Marin County, California, live the longest at 85 years, better than Spain and France. Women in Perry County, Kentucky, have the shortest average life expectancy at 72.7 years, which puts them behind their peers in Russia and Vietnam. Men in Fairfax County, Virginia, live longer than men in Japan and Switzerland at 81.7 years, but men in McDowell County, West Virginia, fare worse than men in Yemen and Sudan as they live to 63.9 years on average. Where did men have the longest and the shortest life expectancies at birth in 2010? Where did women have the longest and the shortest life expectancies at birth in 2010? Click here to download a list of major risk factors and their definitions. The Institute for Health Metrics and Evaluation (IHME) is an independent global health research organization at the University of Washington that provides rigorous and comparable measurement of the world's most important health problems and evaluates the strategies used to address them. IHME makes this information widely available so that policymakers have the evidence they need to make informed decisions about how to allocate resources to best improve population health. IHME Director Christopher Murray and several members of the IHMEs Move! Cities, Towns and Counties.